I’ve seen this commercial for a couple of months now and am totally mesmerized by the woman in the bra! It wasn’t until last week I noticed that the commercial was for Uncle Bens. I was trying to tell someone about the commercial and I didn’t know what she was selling. I haven’t tried that particular flavour… but the chicken and wild rice ones are delicious. 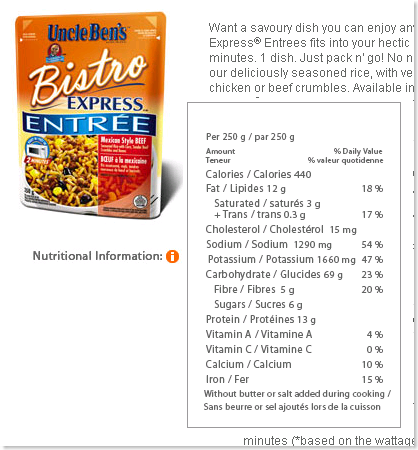 That being said, I ended up at this site because I am concerned over the level of preservatives or whatever miracle chemical is in this stuff: since it has meat in it, but doesn’t need to be refrigerated. Personally I like the commercial with “Mary Mammary’s”…. of course Im hetrosexual, drive fast and drink beer on weekends after going fishing. I dont like the rice advertised in the commercial, it really is very poor quality. I prefer to cook my food, I f you want something fast and easly made then you have to expect some draw backs. Dont think a culinary delight is awaiting your tastebuds if you dont put out any effort! 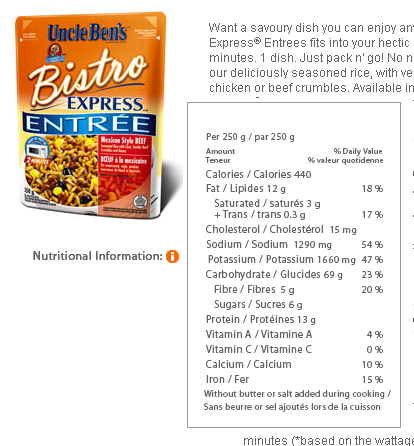 That said, I will stick with Uncle Bens regular old long grain parboiled rice…. its good, and you can addything you want to make it better. I’ll still watch the commercial though….. its wondrfull.